Wall Street is a major player in this year's elections. Wall Street is on track to spend more on this election than it ever has during a campaign season. With two months to go before Nov. 6, Wall Street firms have so far spent $164 million on campaigns and donations to political groups designed to influence the elections, according to the Center for Responsive Politics. That puts the industry on pace to surpass the spending record of $170 million that it set during the 2008 race. The presidential and congressional elections are expected to be the most expensive on record. The Center expects the final tab to hit $2.5 billion, most of which will be spent on television advertising, campaign infrastructure and staff as well as logistical efforts to help voters get to the polls. Securities and investment firms are one of the biggest powerhouses aiming to influence the elections, according the Center. Individuals from Wall Street firms such as Goldman Sachs (GS), Bain Capital and Blackstone Group (BX) have contributed millions of dollars directly to campaigns and through political groups. "We're going to see a lot more [money] from the securities and investment firms going to both members of Congress and presidential candidates," said Bill Allison, editorial director for the Sunlight Foundation, another watchdog group that tracks political influence. Related: How much should the rich pay in taxes? Included in that $164 million is some $50 million which has flowed from the hands of several high-profile hedge fund managers to so-called super PACs, secretive groups that can raise unlimited amounts of cash. More than $40 million of those super PAC dollars went to conservative groups, including some that support Romney. Donors who have contributed at least a million dollars to super PACs include: John Paulson of Paulson & Co., Robert Mercer of Renaissance Technologies Corp., Julian Robertson of Tiger Management and Paul Singer of Elliott Management. The fact that Romney is so popular on Wall Street is no surprise, considering his long career in finance, which included creating Bain Capital in 1984. Romney has raised $11.4 million directly from Wall Street donors, according to the Center. But, Wall Street hasn't entirely forgotten Obama, even though he once criticized Wall Street "fat cats" early in his presidency. Wall Street donors have so far contributed $4.1 million to his efforts to stay in the White House, according to the Center. Many in the industry are interested in easing or rolling back parts of the 2010 Dodd-Frank reforms that added a new layer of regulation to financial markets, Allison said. But Wall Street is also concerned about the eurozone, taxes and the economy. "They're trying to engender the good will of politicians, and they want someone in the White House who understands their issues," Allison said. While Wall Street may be a favorite on the fundraising circuit, it's become a political punching bag on campaign television commercials for both parties, according to Kantar Media's Campaign Media Analysis Group, which tracks such ads. Kantar's Elizabeth Wilner said Wall Street is the "bogeyman" of this year's election cycle, just as Big Oil had been during the 2010 election, in the wake of the BP oil spill. 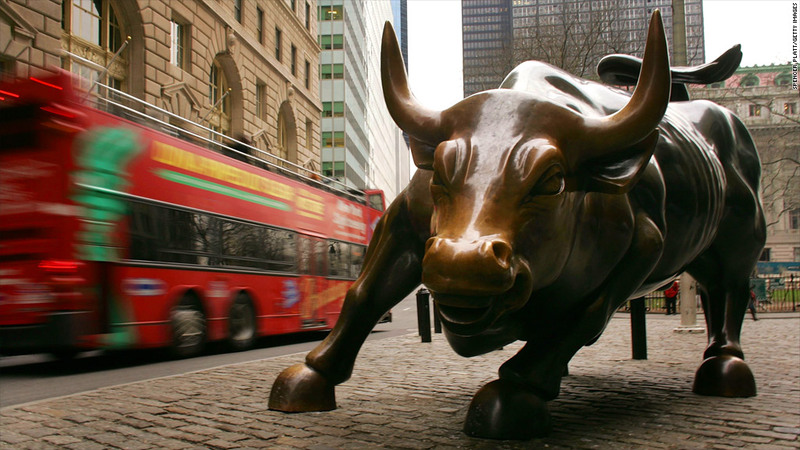 She said the green Wall Street sign and the famous golden bull in front of the New York Stock Exchange have become all too common in congressional political ads, as legislators look to blame each other for the economy's current woes. By contrast, Wilner said, both presidential campaigns have been mostly silent about Wall Street. "Despite everything we saw from Obama's populist campaign, he goes to New York every once in a while to try and raise money from (Wall Street). So he's not attacking them," Wilner said. -- CNN's Ali Velshi contributed to this report.